RIO DE JANEIRO (AP) — Skies and pools both darkened Wednesday as the sun-splashed Olympics in Rio de Janeiro gave way to gray clouds and murky green waters. The Rio Games were drenched in rain and continued questions about why the diving well and water polo pools look so much like neglected aquariums. The first American male basketball player to appear in four Olympics, Carmelo Anthony passed LeBron James as the national team's most prolific scorer. The U.S. men's basketball team needed every one of his 31 points as they got their first good test in fending off Australia 98-88. Katie Ledecky's strong final leg helped the U.S. women win the 4x200 freestyle relay over silver medalist Australia. Brazil finally found its scoring touch in the men's soccer tournament at the Olympics, the host country advancing to the quarterfinals by beating Denmark 4-0 and avoiding an embarrassing elimination in front of the home fans. Brazil plays Colombia in Sao Paulo on Saturday. The third day of the men's water polo tournament began in green-tinged water, though not nearly as dark as the neighboring diving pool at the aquatics center. It was crystal blue the day before. Water quality has been a major issue surrounding the Rio de Janeiro Olympics, but in the ocean and lagoons, not pools. A decrease in the alkaline level in the diving well Tuesday afternoon led to the green color, organizing committee spokesman Mario Andrada said. He added that the pool for water polo and synchronized swimming is being affected in the same way but "we expect the color to be back to blue very shortly." Rio organizers insisted the athletes weren't at risk in the green pools. They were on the waters and slippery roadways, though. Strong winds rattled palm trees along the coast and whipped up waves on the scenic lagoon where rowing was postponed for a full day for the second time this week. With winds too blustery, rowers packed up their oars for the day as cyclists hit slick roads on skinny time-trial bikes unsuited to harsh weather conditions. Under dark skies, the cyclists faced lashing rain and wind on the time-trial course along Rio's southern coast. The conditions might have cost Ellen van Dijk of the Netherlands a medal. She slid off the road and got tangled in weeds before finishing fourth. American Kristin Armstrong won the race. With the cooler weather, away went the bare skin and out came the full leggings and long-sleeve shirts in beach volleyball as temperatures dipped into the lower 60s after sunset, the coldest night yet. SWIMMING SHOCKER : Kazakhstan has its first Olympic swimming medal, and it's golden. Dmitriy Balandin pulled off a stunning upset in the men's 200-meter breaststroke, winning from the eighth lane to put his central Asian country on the swimming medal stand for the first time. Yosuhiro Koseki of Japan went out fast and was more than a second under world-record pace at the final turn but faded to fifth. Josh Prenot of the United States claimed silver and Anton Chupkov of Russia landed the bronze. EBNER ELIMINATED : Nate Ebner, the safety for the New England Patriots who took a break from training camp to fulfill his Olympic dream, sprinted from almost halfway to score a try in the right corner against Fiji to make it 24-19, piling the pressure on Madison Hughes. But the U.S. captain and goal kicker missed the conversion from out wide, leaving the margin at five. Less than that and the Americans would have advanced. ROWING AT RISK : Twenty-two races, including the first two medal races, were postponed in the regatta but international rowing federation director Matt Smith said there's still room on the schedule without having to resort to drastic measures — even if competition is also called off Thursday. 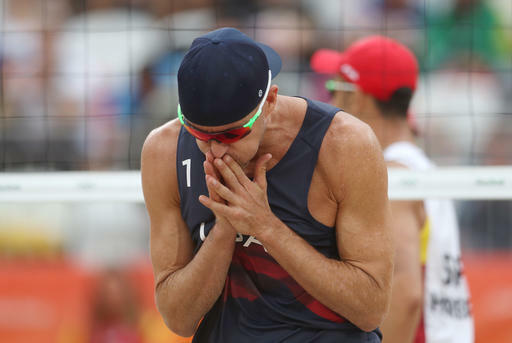 LIFE'S A BEACH : The American beach volleyball team of Jake Gibb and Casey Patterson were eliminated from the Olympics on a tiebreaker. That's the first U.S men's team to fail to advance out of pool play since the 2004 Athens Games. On the women's side, April Ross and Kerri Walsh Jennings defeated Switzerland and boisterously celebrated after the match. But the Americans lost a set — something that has happened only once to Walsh Jennings in the last three Olympics.